I hope everyone had a wonderful Halloween! We certainly did. My kids all dressed up as Star Wars characters this year. My youngest daughter was Yoda, my son was a storm trooper, and of course, my oldest daughter was princess Leia. They were beyond excited. Especially since they've seen the first two original movies (I am talking the 1970's classics). So, my husband has a thing for donuts. Like a serious thing. He likes to have one every morning before he goes to work. Me, on the other hand, could care less about donuts. In fact, I don't eat them. Since his routine has become pretty regular, I decided I would give homemade donuts a try. 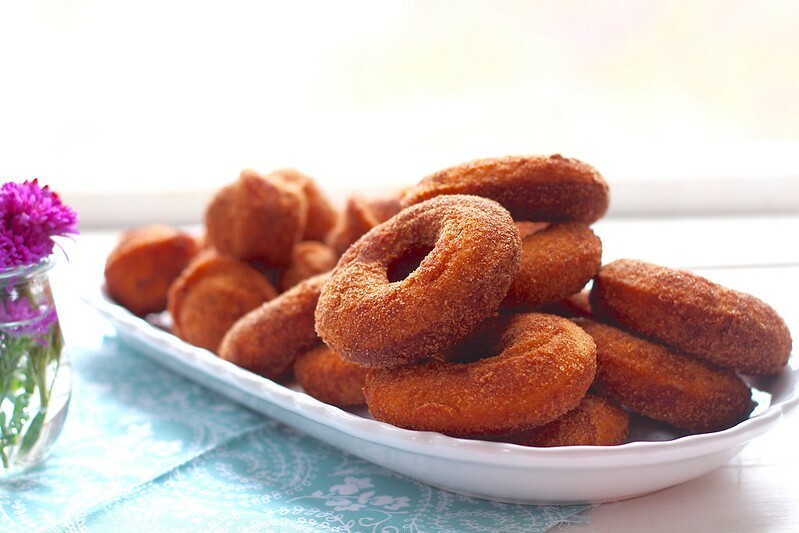 I have made baked donuts before, and even deep fried ones. But, I hate deep frying. Something about knowingly cooking something in that much oil just really turns me off. It has to be a serious special occasion- like my beloved churros (which, in fact, I rarely make since they are definitely a rare "treat".) 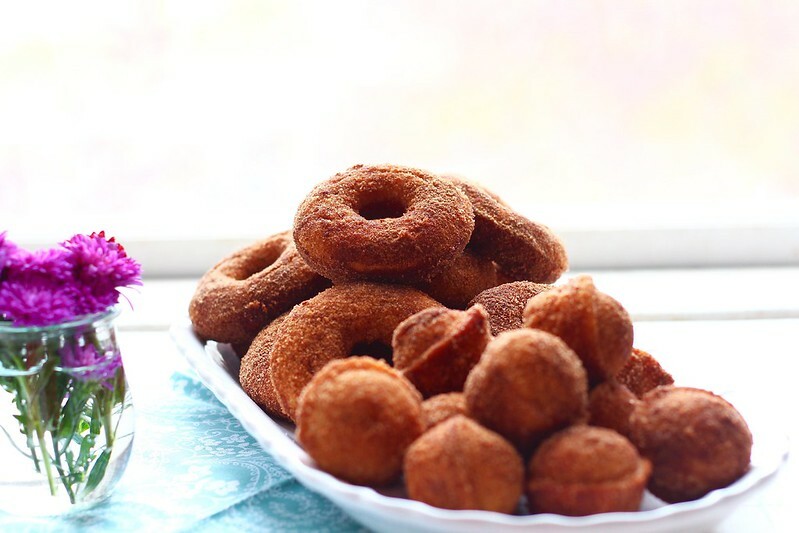 Plus, I don't like the idea of feeding my husband a deep fried donut on a regular basis. So, I got some donut pans for baking instead. Before you start with a baked donut, there is something you should know. Yes, they are healthier, easier and dang delicious. But, they are more cake-like then a typical fried donut. For my husband, that doesn't bother him. However, it may deter or disappoint die-hard donut lovers. Now that I have forewarned you all, lets move on to how delicious and beautiful these donuts are. Since apple cider is in stores right now, we are trying to take full advantage of it. That means buying a gallon weekly for everyone to enjoy cold, and warmed with cinnamon. And it allows me to ignore the screaming fact that eggnog is ALREADY being sold in stores. What the heck!? That's a christmas drink people! Moving on. 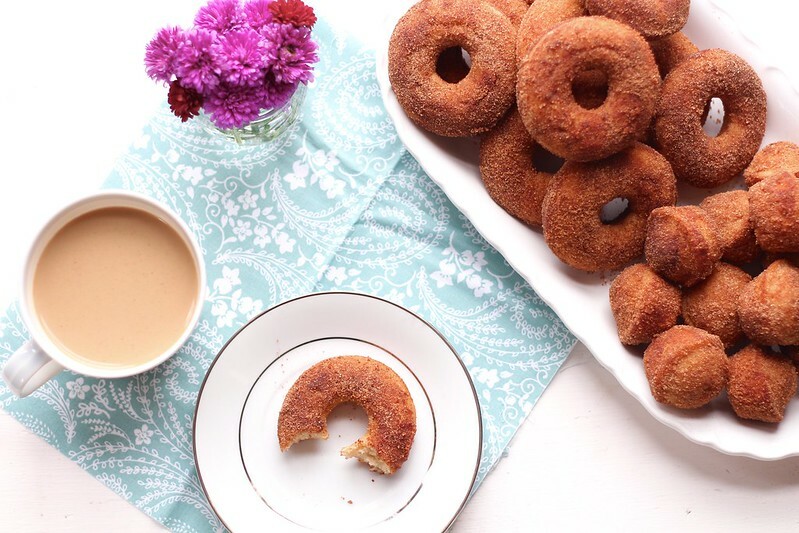 These donuts are the embodiment of fall. We've got fresh apple cider and cinnamon going on here. And some butter too. Can't forget butter. 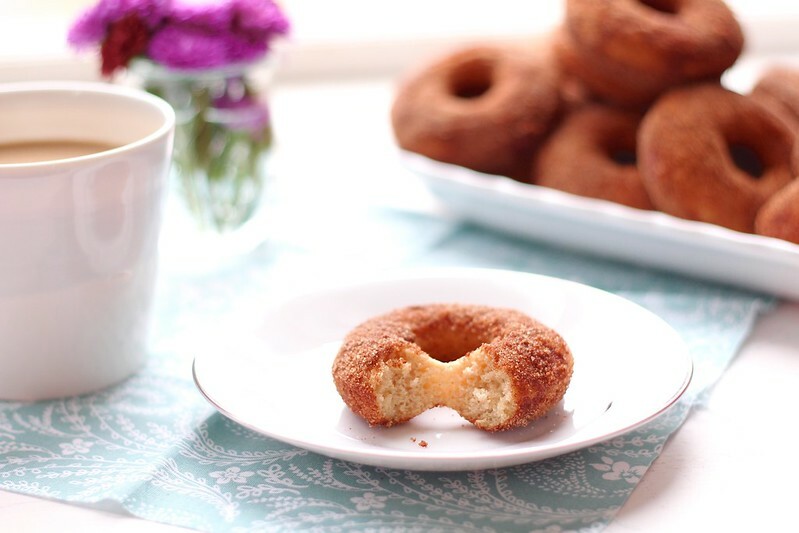 These donuts are soft, chewy and slightly addicting. Especially with the cinnamon sugar coating. Yes, I actually ate some of these. You definitely need to make these for your breakfast tomorrow. Or for your second (or third, or fourth) cup of coffee during a hard day. It will brighten your day, I promise. Preheat oven to 400ºF. 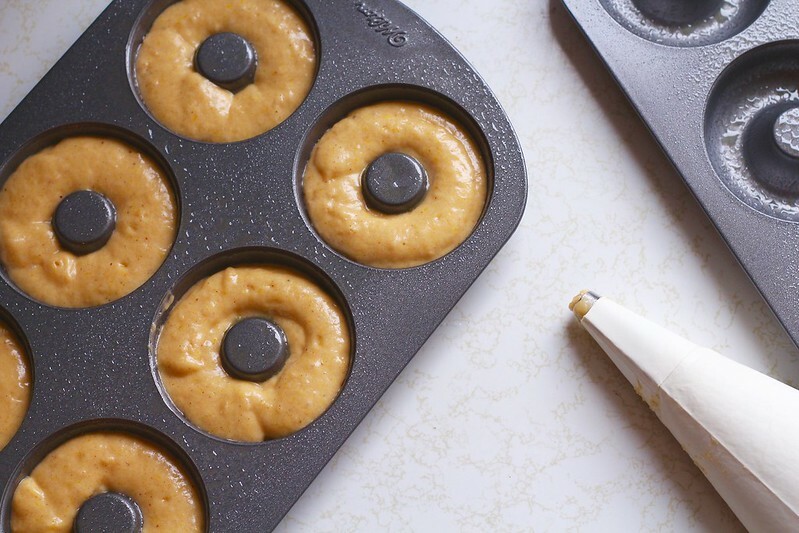 Grease a 12 regular size donut pan and a 12 hole mini muffin pan. Have ready a piping bag fitted with the regular tip. In a medium pot over medium heat, melt the butter. Stir in the apple cider, and set aside to cool. Meanwhile, whisk together the flour, baking powder, salt, cinnamon, and nutmeg in a large bowl. Whisk the sugar, honey, and eggs into the butter mixture until evenly combined. Stir the liquid ingredients into the dry mixture until just combined. Scoop batter into piping bag (it will be messy, so try to keep the bag flat while filling), and pipe evenly into the prepared pans. Bake for about 7 minutes, or until springy to the touch. Allow to cool for about 1 minute before removing donuts onto a cooling rack. Meanwhile, make topping. ** Melt butter in a small pot and stir in the cider. In a large bowl, mix together the cinnamon and sugar. 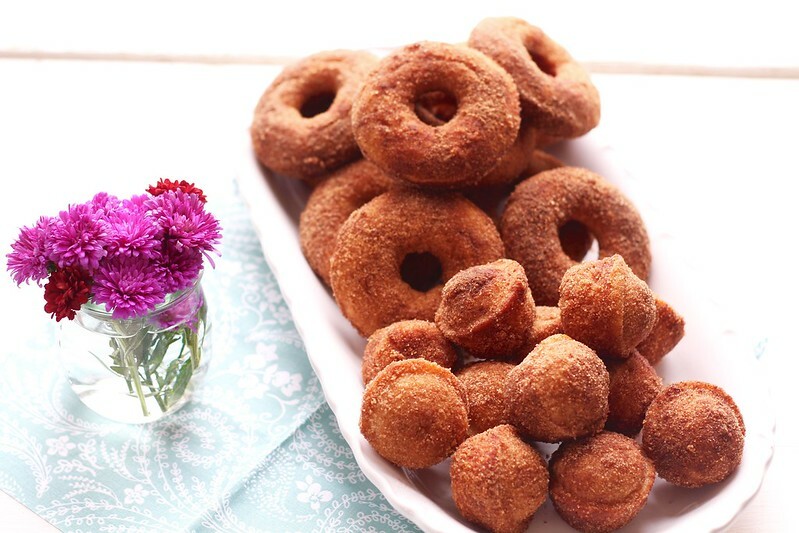 Dip each donut in butter mixture and roll in the cinnamon-sugar mixture to coat. Place back on cooling rack. Best served the same day. Store, uncovered at room temperature. *You can easily halve this recipe without changing the baking time. 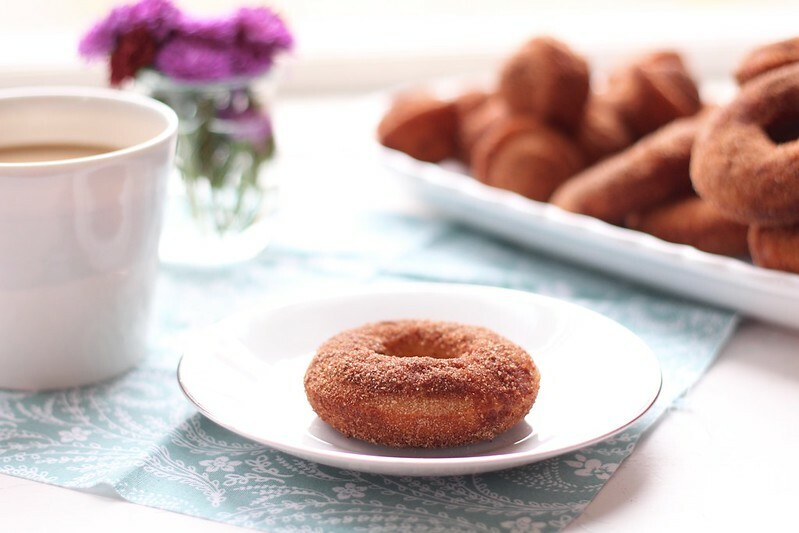 **If you want to donuts to last longer than one day, don't coat with the butter/cinnamon-sugar mixture. They get very moist after a day when coated. They are just as good without the coating!